The SMART Board is an interactive, electronic whiteboard which can enhance instruction and learning. SMART Boards have touch sensitive screens and are interactive tools that invite student participation in the learning process. It brings the power of a new dynamic educational tool to the classroom. It positively affects learning by helping to raise the level of student engagement, motivation and enthusiasm within the classroom. 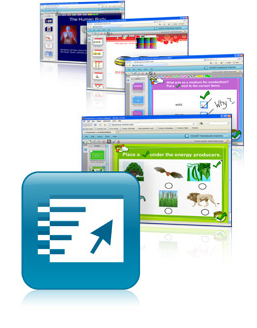 The SMART Notebook software makes it possible for teachers to create content rich, dynamic lessons which address specific student skills. Remember... "As with all technology, it's how it's used, not the technology itself, that will ultimately determine its value for teaching and learning" so please use it wisely. Don't have notebook software on your computer no problem use... SMART Notebook Express to view, save, and interact with Notebook files via internet connection or the light downloaded version free of charge. Don't have time to create your own Notebook Lesson... use the SMART Exchange to download already created SMART Notebook files and connect with teachers across the globe.